Bring back Ellen! Bring back Ellen! Billy Crystal was a pretty darn good host of The Oscars back in his day. Ellen Degeneres was a really good host of The Oscars just one year ago. 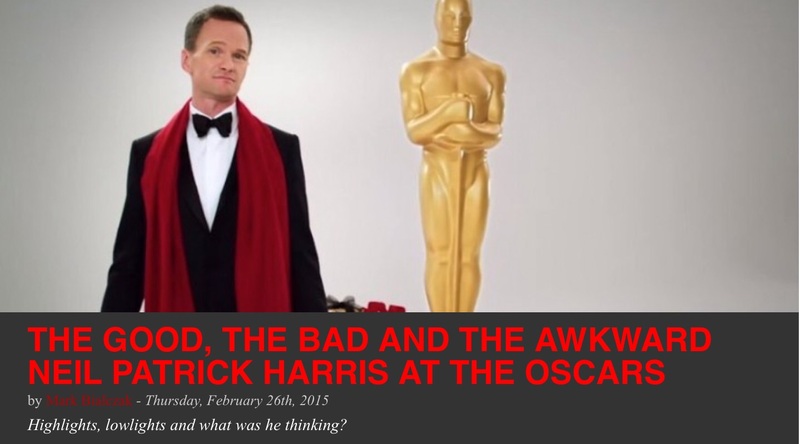 Sunday night Neil Patrick Harris was a train wreck. I wrote about it as part of my weekly Film News blog for the Syracuse New Times site. You can read it by clicking the link below. Over there, I go over highlights and lowlights from Sunday night’s ABC broadcast. A couple of the acceptance speeches were pretty grand. Some of the musical performances carried the flame proudly. Neil Patrick Harris, no. With the chance to be the man who deftly bridges America from star to star, he made me squirm with his smugness and ill-suited delivery. Here’s a link to People magazine’s video of Gaga and Julie. “Birdman” or “Boyhood” in the end? Billy, Ellen or Neil? Lady Gaga or Julie Andrews? I did so badly with the awards shows this year as I barely saw one movie or TV show (Golden Globes) up for nomination. As for Neil Patrick, I’m usually a fan of his. Maybe after a few hosting duties, he’s run out of ideas. And his writers were really, really bad. Oy, Marissa. I thought NPH was pretty funny–his joke referencing JK Simmons insurance commercial was great. My favorite bit was his wandering in the front rows where all the celebrities were and pointing out the seat fillers. The Oprah rich joke didn’t go over well–until he explained it. Anyway–John Legend/Common song AND speech was the highlight, followed closely by the “stay weird” acceptance speech by Graham Moore. I really wanted to see Linklater win because I love his earlier work and this may be the only chance for him to win. Michael Keaton got screwed over too. i agree with your highights, and picked most of them in my SNT column. But I just don’t agree on NPH, alas, Phil. Well, it may turn out that the Oscars say buenos noches to NPH. As most of the country never sees artsy Oscar-nominated movies, the man in double-briefs scene wouldn’t make sense out of the context of seeing it. I only know bc I’ve seen so many late-night clips of that scene. Otherwise, it just looks like buff pride. And we all know Gaga can sing; I just don’t want her to. Lately she seems like she’s always in character, this fake forced Tony Bennett-loving character. And I’m sorry, I can’t get beyond the arm tattoos. It’s just not classy. Or klassy. And I realize everyone jumped aboard the tat ship in the 90s, but that doesn’t it mean I’m down with it. Gaga seems like she just had her 5th drink and you want to pull her to the side and say, “Okay, okay, you’ve had enough. Tone it down.” But then she never snaps back into reality. She is constantly floating through her high. I’m fine with class or race jokes, but not jokes right after a speech about a suicide. It’s a hard task, that hosting. It is a hard job indeed, Kerbey. Ellen was great at it. NPH, not that night. Wow, you do not like Gaga. She sang the medley wonderfully, I thought, not the hint of a Mojita to it. She has a great voice. She can sing. I just don’t want to look at her weird mannerisms while she does it. Billy Crystal was the best host of the Oscars. Ellen did an awesome job, and I’m really surprised they didn’t get her to do it again. I think that Neil Patrick Harris didn’t do a good job because his background is in acting. Billy Crystal and Ellen DeGeneres both have backgrounds in comedy. I think NPH tried to be funny and wasn’t, so you could be right about that, sirius. Good call there. i agree with your nph review, i only saw the pre-show and first hour, so i can’t speak for the rest, but it sounds like it only got worse. i did think boyhood should have won for director and pic, from all i’ve heard, though i haven’t seen it yet, but admire the huge undertaking that this was. i wanted keaton for best actor. i loved birdman and think it was chosen because so many in hollywood could identify with the themes of this film. great review of the night, mark. You and mg should rent ‘Boyhood.’ It’s such a great social commentary on a 12-year slice of America. Linklater is great at this stuff. And I think you are right about Hollywood relating to the ‘Birdman’/Carver premise, Beth. Thanks for reading my review, and pitching in here. I like NPH, but I think one should have had enough career accomplishments to first be considered as an Oscar host. Ellen and Billy fit that, NPH doesnt. I can’t believe that there isn’t an A list actor that wouldn’t do it. Can some of the ridiculous filler jokes, tighten up the ship, and get someone in that can keep it moving. Clooney would be great, imo. Great comments and suggestion, Apple Pie. Clooney would be highly respected. I agree. Boyhood of course. Or even Whiplash. Or Grand Budapest. But not Birdman. I’m good with Keaton not getting the Best Actor award. He was great in the movie, but not Oscar-worthy, my humble opinion. I still don’t get all the fuss for Birdman. I like NPH and think he did an ok job. No, he’s not Ellen and he’s not Mr. Crystal. But I didn’t hate him on the show. He got to do a magic trick and sing–both part of what makes him who he is. Plus he’s just pretty to look at. And he made an off-the-cuff joke about the pom-pom dress. The underwear thing went too far. Crimeny. Julie Andrews. Am in full agreement with Kerbey (there’s a shocker) re: tats. But my 12-year-old daughter is all gaga for Gaga so there you have it. Generational. Off you read your full review. ha, should have saved my full reply until after I read your review. Seeing the pom-pom joke in a different light now. Hadn’t hit me that way at the time, but I see what you mean. Funny how we all perceive things differently. I saw Phone call and also the Crisis docu short, so do appreciate the crisis center hotlines. But was also taken aback by the pom-pom shawl and appreciate the comment. You read a lot more in NPH’s than I did. Maybe because I’m a girl, I was paying more attention to clothes, etc. And the fact that Michael Keaton was chewing a big wad of gum for most of the ceremony. Glad to hear your Oscar thoughts, Mark. Was looking forward to this post. I didn’t get to watch, too jet-lagged, but Matt felt that the “bermuda shorts” comment was the night’s low point, courtesy of nph. I thought the night was full of low NPH comments. Thanks for pitching Matt’s opinion into the stack here, Jay. Hope you’re over your jet lag. I didn’t think he was as bad as you thought he was. He had his moments, some of which I thought were pretty good and funny. But I do think he looked a little stiff at times…and a little lost. And I agree that his prediction box thing took up a lot of time and fell flat. That is what made Ellen so great, Christy, her ability to think on the dime. Indeed. Billy Crystal was like that, too. Improv comedy! 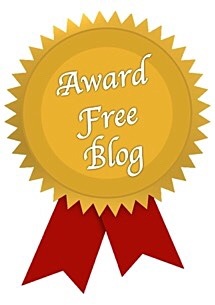 Thanks for reading my column over at the other site. Yes, Travolta went from messing up her name to unwanted touching! Gack. Yes, it was ‘let me get up close and personal without your permission’ … which isn’t creepy or anything?! Hehe. I think she’s going to have to issue a non-JT order to the Oscar people for 2016, Christy. Poor woman needs some relief. I look forward to the Oscars every year & make a big night of it – dinner brought home to go & I even print the ballot & follow along – yeah weird I know, but my mom always did it & I picked that little nuance up from her :-). This year, I have to admit, I was not thrilled with the hosting. I like NPH, but did not think this was a good venue for him. I’m glad to hear that you keep up the family tradition, Sadie. That is a fun way to follow along. But dang, that NPH made it hard to like the interludes. Nobody ever mentions Steve Martin as Oscar host. He was my favorite! “They finally got to the bottom of the Russell Crowe kidnapping plot. Tom Hanks, you should be ashamed of yourself.” And Martin was just so classy and handsome in a tux. I adore him. You’re right, MVG. Steve Martin was good as host. One vote, Mr. Martin. Yes, he overstepped his welcome, for sure, Diana. That dress joke made me angry, too. I agree. There were definitely some uncomfortable moments during that show. And right from the start…his first joke about it being a white man’s show..not very tastefully done if it could have been at all. This was an Oscars of protest, with a hashtag even, because of the snub of ‘Selma’ director and star in nominations and other issues, Red, but his delivery of the line didn’t defuse it or help resolve it, either. Oh goodness. I just read your column little brother. From what I understand, Ellen has been blackballed for some silly reasons known only to the Hollyweird insiders, but NPH as a substitute? Baaaad. I didn’t watch the Oscars, or anything else for that matter, because I was making up for a lot of lost sleep, but I can see I didn’t miss much. I’ve noticed several comments about Lady Gaga’s tats, but I guess I’m so used to seeing tats around here it took me a long while to pay attention and actually look at them. I was mostly listening to her beautiful voice. When I see NPH, I see a teenage doctor with very little talent as an actor. Didn’t like Doogie Howser then, don’t like NPH now, and they must be scraping the bottom of the barrel now to find hosts if he is the best they could come up with. Personally I think the Oscars have outlived their fame and usefulness, and are now just something else that is bought and paid for. Doesn’t mean the best of the best today, just the best at bribing the right people for votes. Politics, Hollyweird style. It just doesn’t carry the prestige it had when I used to watch it back in the day when the award actually meant quality and achievement. Really professional hosts, like James Stewart, Sammy Davis, Jr., and several names I can’t remember at this hour of night, but different each year, dressed in tuxes, not making a joke of the evening. I guess I tend to compare things too much to what was instead of accepting the poor quality of what is, but some things are sacred and just should never be messed with. Times have changed, Angie. I don’t recall exactly those days and those hosts even though I did watch at times with my parents, but I bet the hosts did make some jokes sometimes. Nowadays, though, that’s the whole idea of the MC, it seems. Not for the Grammys, though, with LL Cool J doing a good job of moving things smoothly from act to award to act to award. I know, different animal. But I like the Grammys way more. 2. I did not see the show, but watched clips. Yes, Gaga’s performance was great. Yes, Travolta’s creepiness was creepy (sexistly creepy). 3. I didn’t see but a snippet of NPH, so cannot judge, but what you describe is so out of character for his in prior appearances as emcee or guest on talk shows–in that he has been witty, appropriate, and excellent at quick off-the-cuff repartee–that my suspicion is the man was extremely nervous about “doing the Oscars”, or there is or was something off in his personal life that led to his poor performance. Too bad–for him, and the audience. I think NPH was in over his head for a combination of factors, unfortunately, and the scope of the Oscars just made it spiral out of control slot by slot. I couldn’t give him a pass on it, though, that’s how bad I thought he did his job well paid to do. The tatts bothered me not in the least, Babe, and that’s why I didn’t even mention it. I don’t think it’s a gender issue with my commenting friends, but a tatts issue, knowing them like I do. I am glad to have you point that out and gently remove those too-easily raised chips from off my shoulders again, Mark. Thanks. We were traveling home Sunday evening and I missed the Oscars. Darn it, I love to venture my opinion but feel I should have at least seen five seconds of the show before doing so. I did see a clip of Lady Gaga’s performance which was pretty darn impressive. NPH is usually quite adept at handling these types of venues, I wonder what went wrong? In researching, I saw he had a joke writer who was not a comedy guy. I think he should have not agreed to that, first off, Barbara. Too bad you were traveling. Or maybe not, because you can catch all the worthy moments on clips now. Thanks for the link People showcasing Lady Gaga singing Julie Andrews’ song “The Hills Are Alive with the Sound of Music.” I still love Julie best in that role, but Lady Gaga is a super talented singer. I hope that she continues to dump the outlandish makeup and costumes. She is stunning and her real talent shines thru. I truly enjoy Gaga going regular, Judy. Indeed. I understand and appreciate modern, but I don’t think she needs to go over-the-top as she has sometimes. NPH will be fine. He’s still a star. Just not here anymore, I hope, Rachel. 🙂 Perhaps he was just nervous.